Welcome to the Green Phone Booth, where women write and work together toward a cooler, cleaner, healthier planet. Individually, we face the same frustrations and challenges that you do in trying to live more lightly on this Earth. Together, we’ve created a community that fosters our efforts. 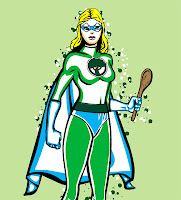 All of us aspire to green superhero status. Some times, we are wildly successful and, other times, our capes fail us. But we do try – and we know you do, too. Join us on our adventures! We can always fit another hero into the Booth. At first glance this mom of two seems ordinary enough - wiping up spills, working as a writer and keeping everybody fed. But underneath her unassuming exterior, she's crusading for truth, justice, and the health of our planet from her home in Canada's coastal rainforest. A little bit of moisture can't slow her down! In her crusade for the climate she's a second-hand-shopping, litterless-lunch-packing, do-it-yourself-ing, non-toxic-product-using dynamo, who's keeping it real in the suburbs. Read past posts by Climate Crusader. Learn more about her Alter Ego. On the surface, Eco-novice may appear to be your typical overwhelmed mom of young children, consumed by potty training, play dates and nap time. But beneath this placid surface lurks a fearsome researcher using the power of the Internet to unlock the mysteries of product ingredient lists, plastic-free kid gear, government chemical regulation, and reusable and handmade alternatives to the standard mass-produced junk. She'll show you that over time even small green moves can pack a big punch. Green newbies everywhere, you have a friend in Eco-novice. Read past posts by Eco-novice. EMERALD APRON! By day she teaches teenagers about sustainability. 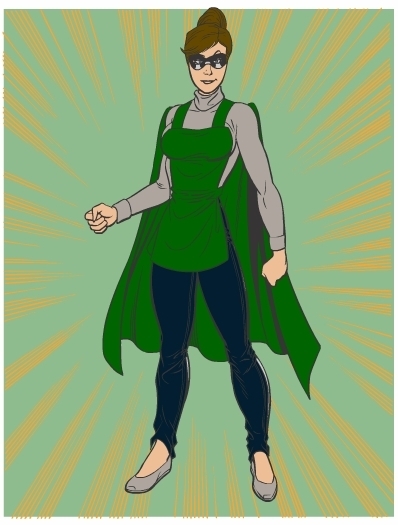 But after school, this farmer’s daughter ties her cape around her waist to become Emerald Apron: super mom, wife and homesteader! Watch as she does her best to save the planet by starting on the home front, with a baby on her hip! 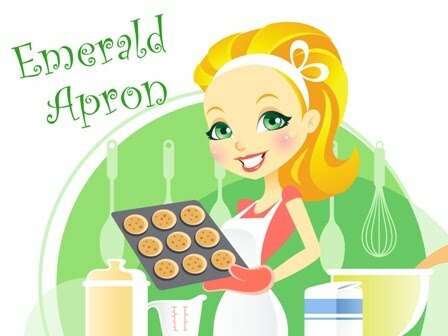 Emerald Apron dreams of living a self-sufficient life and isn't afraid to get her hands (or cape) dirty! Read past posts by Emerald Apron. With a sippy cup in one hand and a spade in the other, Going Green Mama stands up for slower living and faster bedtimes. This working mom of two and wife of a college student wages a silent war against excess and the Green-Eyed Monster. It's not easy being green, but Going Green Mama, with her sidekicks Green Thumb and Little Bear, is paving a path towards a simpler life. Read past posts by Going Green Mama. Read past posts by The Homegrown Mama. 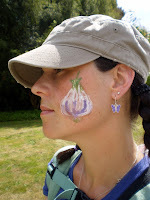 Read past posts by Jenn the Greenmom of the Burbs. Give this unassuming suburban mother and teacher a shovel, vinegar and baking soda and a recycle bin full of potential and she transforms into a composting, gardening, crafting, DIYing queen. Her super powers include hoarding glass jars, egg shells and cloth bags. Her kryptonite is driving a mini-van and lurking consumer desires. When she's not researching ways to save the Earth (otherwise known as avoiding laundry) she can be found in her garden, on her bike or in nature taking photos. Read past posts by Queen Composter. She seems like your average housewife; doing laundry, cooking dinner, and doing all the other housework. It would seem her battles would be against things like soap scum and mold. However, there is more to this Retro Housewife than meets the eye. In her backyard hides rotting food and you won't find paper napkins in her house. This housewife is a climate change fighter and C02 is her worst enemy. Her weapons include glass straws, cloth napkins, and organic food. Around her waste and pollution don't stand a chance! Read past posts by Retro Housewife. Alison is not your run of the mill mom! Not this superhero. While greening her family of three, she seeks out ways to embrace meaning instead of material, foster social consciousness and community, absorb the ins and outs of nonprofit management - all while wielding a pair of running shoes and a whisk. 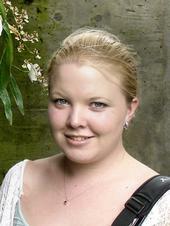 Read past posts by Amazin' Alison. Most days, Burbanmom is simply an ill-mannered suburbanite but when annoyed by political agendas or consumer indifference, she morphs into The Bulk - an unstoppable beast of near unlimited strength, power, and sarcasm. The Bulk’s endurance makes her an untiring creature capable of square foot gardening, carpooling, and writing letters to her representatives. Very little has been known to faze the Bulk, except those with greater powers such as Big Oil, CAFO, The Bush, and Invisible Cheney. Truly a marvel, the Bulk is committed to helping other individuals join the fight against these planet-wrecking villians. Read past posts by Burbanmom. Though she seems like a mild-mannered mother of three boys, The Conscious Shopper carries a powerful secret weapon - her wallet. With this weapon, she fills her fridge with local and organic foods, stocks her shelves with non-toxic cleaners, dodges excess packaging, and searches for eco-friendly clothing...while trying to stay within her budget. 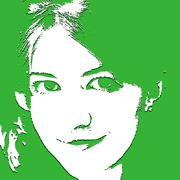 Will she be deceived by the pitfalls of Greenwashing? Can she defeat her arch-nemesis Advertising and its sinister sidekick Cheap Plastic Crap? Stay tuned to find out. Read past posts by The Conscious Shopper. But, even super-heroes are human... The EcoWonder has been seen buying individually wrapped granola bars, eating at the local pizza joint and sometimes forgets she left the cell phone charger plugged in. We all need a little help now and then! Read past posts by EcoWonder. Normally a timid creature with an annoying tendency to stray from the flock. When warranted greeen sheeep morphs into EnviRambo, sentinel of all Earth inhabitants. Has the power to nourish unsuspecting junkies. Is able to transport armloads without a plastic bag. Can cut power consumption in half. Has a wrench and knows how to use it! Read past posts by Envirambo. Shrinks garbage faster than a ravenous worm bin. More committed to building connections than a magnet. Known to wield a keyboard and a mouse as weapons. And able to plant Victory Gardens in a single day. Read past posts by Green Bean. And is able to write her dissertation while breastfeeding! Read past posts by the Raven. By day, JessTrev's your average mom, juggling six tasks too many and finding her days too short. But here? She slides on into her shero suit and wakes up as Olive S. Oyl. Olive. Olive who? Olive you! Olive Stopping Oil. And Olive S..oyl. Olive Soil? Olive that Green Earth, baby. Willing to wrap her ectomorph arms around the globe to bring together legions of sheros ready to do what it takes to make our children's world worthy. Read past posts by Olive S. Oyl. Able to convince children they do not need the plastic toy du jour. Works miracles with baking soda and vinegar. Grows peas so sweet they must be magic. Now if someone can just teach her how to cook an eggplant her family will eat! Read past posts by Sustainamom. At home, her children call her the green momster, but when she steps into the phone booth, this mom of three becomes.....the Greenhabilitator! On a never-ending quest to diminish her footprint, the Greenhabilitator looks at everything that passes through her hands and asks one question: "How can this be done in a more sustainable way?" 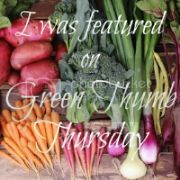 Follow along as the Greenhabilitator works to brings back a simpler way of life for herself and her family. Read past posts by the Greenhabilitator. feeding compost to her backyard chickens, taking every freelancewriting opportunity that comes her way, and studying to be a nurse. 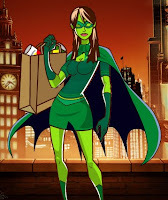 Read posts by the Kelly Green Giant.Learn more about her Alter Ego.